This three-piece jewelry set includes a double strand necklace, bracelet, and a pair of stud earrings. 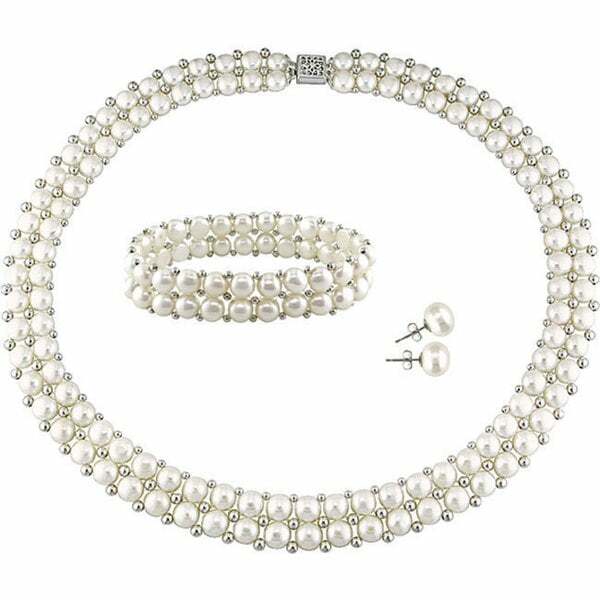 The white freshwater cultured pearls are complemented by a square detailed sterling silver clasps to complete the traditional look of the set. Each pearl ranges from 6 to 8 mm. This is the perfect blend of style and classic tradition making it a perfect gift. Suitable for her or even an entire crew of bridesmaids besties. All carat weights and measurements are approximate and may vary slightly from the listed information.?? I bought five sets of these as gifts for my bridesmaids to wear the day of my wedding. Overall I was satisfied with what you got for the money. A necklace, bracelette, and earings for the price of just one of those items elsewhere. The necklace has some decent weight to it. My only dislike was that the pearls were not round but more flat on the bottom which gave them the appearance of being of fake. However, when worn you will not notice. I've been thinking about getting a set for myself!!! I've bought at least 4 sets of pearls before. Always single strand freshwater pearls and I'm always only half satisfied. Someone said in a review that good thing there were two strands because they were very small, but I don't think they are so small at all. For this price, you can't expect akoya 12MM pearls! but this set is EXTREMELY beautiful. as for the quality, I cant say. I haven't given them to her yet. As for beauty, there is NO WAY she will be disappointed, and I say this coming from experience. this is the most beautiful set of pearls i've ever bought. SO happy with this!!! I bought it for myself because I always like wearing pearls and i cannot believe the price i paid. The pearls are all gorgeous quality. Love the double strand look of both the bracelet and the necklace. The necklace is a great length and can be worn with everything. The studs are fabulous, simple and elegant, but they are really comfortable and i am happy with the back clasp. WHAT a great find. Exactly what I hope for. I'm very pleased with this set. It is exactly what I had hoped for based on the descriptions and pictures. I'm not a pearl expert, but I read the description and reviews carefully. They match the description for quality and style. I'm very pleased with the pearl quality, even if some people think that it's not up to snuff. Overall, the set it beautiful, with just enough of an elegant accent from the silver beads to make it something special--not just a single string of pearls. The difference is very elegant, and not gaudy. I'm proud to make this my anniversary gift to my wife. The freshwater pearl jewelry set was a gift for my adult daughter. She actually picked it out, and we were extremely pleased when we received it. It is a beautiful set, very classy. Every woman needs a set of nice pearls in her jewelry collection. I wasn't expecting the back of them to be so flat but I don't really know anything about the different types of pearls. Good price for the set. Wish the necklace was a little shorter or could be adjusted to wear more like a choker. The clasp is nice in that it just clicks together. I was nervous at first about ordering this set due to the not so kind reviews by previous purchasers, but knew I wanted a complete set of pearls just like this when I laid eyes upon it. I am extremely thrilled that I trusted my gut and did order this set because it is absolutely Divine!!! It does not look cheap and instead heightens the look of sophistication and class for any woman that wears these pieces. Sooooo thrilled to be a proud owner of this exquisite set and might even gift one to someone else!! I purchased 5 of these sets as gifts for my bridesmaids to wear at the wedding. The sets arrived individually wrapped in silver satin bags which provided a pretty presentation. The pearls were very pretty and I think an exceptional value for the price. Also, I inquired about a quantity discount and received an additional 7% off for ordering 5 at the same time. Great deal! i bought this as a christmas present for my wife. i think i ordered it five or six days before christmas but it got to me two days before christmas so that was great. the necklace is far more beautiful in real life than in the picture. she loved it when she opened it. the only problem we had with it was the bracelet. it didnt have a silver brooch like the necklace, instead it just stretched. as soon as she put it on my daughter went to admire it and somehow one of the stretchable bands broke. so my wife cant put the bracelet on anymore... otherwise she loved the necklace and the earrings, they matched perfectly. Necklace About 2 Inches Too Short !!!!!! Beautiful and a dream to wear! Perfect for my sons wedding. The pearls are not spherical, they are round but flat. Never seen something like that. . Always a good idea to have a pearl necklace and a bracelet that match, especially since this was bought at a great price. The pearls are a little small though. Great items, great price! My mom LOVES them!! I ordered this for a gift and my daughter in law loved it. "how long is the necklace"
The necklace is 17 inches long. Yes, it is. I hope this helps. "do i get a nice looking box with it? can you put a picture up of what the box will look like? i'll buy it if it's not a plastic box. please reply asap"
Thank you for contacting us francis98. We ship this item in a pouch. Please let us know if you have any further questions. What is the length of the necklace and bracelet?